Located on the shore of the largest lake in Norway, Atlungstad started out as the idea of a local goldsmith. He used the fields as his practice area, and one day he had a bit of an epiphany, wouldn’t this area make a great golf course? This premier piece of land allowed the renowned architects of Dave Thomas Ltd. to create a course that retains a consistent feel while offering variation, including forest holes, classic heathland and a few seaside-like holes. As one might expect with a Thomas design, there are some fairly long par fours at Atlungstad, undulating greens with some well placed runoffs and of course cavernous bunkers guarding the greens. Atlungstad starts out with a long heathland par five, first and second shots are pretty straightforward, but the green is slightly elevated and guarded by solid bunkering in typical Thomas style. The stretch from hole 2 through to 8 makes up the forest part of the course with the 5th as the most memorable in my opinion, fairly short par four dogleg right with the tee shot challenged by a well bunkered landing area. If you are too aggressive, those bunkers will leave you with a very challenging second, too conservative and you are left with a blind approach to a long narrow green guarded by water to the right. The 6th is a gorgeous par three laying claim to the title of signature hole. It’s not overly long, but it has a nice little pond in front and a cavernous bunker guarding the left side adding a fair challenge. Combine a wonderful view of the heathland holes with lake Mjøsa in the background and a wee bit of distraction is to be expected. The 8th is the monster of the course, par four at 400 meters from the club tees. Two proper belts are needed to make it in regulation, however if your shots aren’t quite perfect be wary of the cunningly placed fairway bunker around 70 meters from the green. The course turns to the heathland stretch at the 9th, the yellow wispy grass contrasting the green fairways and some barely visible bunkers lurking make you look around a bit, half expecting the soft burr of a Scot greeting you. The 11th is the finest of the heathland holes in my opinion; a medium long par four with beautiful bunkering, lumpy fairway and a very tricky green demands a clear plan and crisp execution. 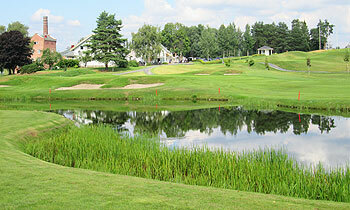 The 16th is a very fine par three, and also a challenger for the signature hole. It’s medium long at 160 meters from the club tees, with the green guarded by a single tall fir to the front. The putting surface is quite undulating with a runoff area to the back feeding into trouble. Even with so many fine holes to choose from, the 17th is undoubtedly the signature hole, a short par four located on the lakeside where the tee shot must carry over 150 meters of lake Mjøsa. Played conservatively a well-placed tee shot of about 200 meters should leave you with a short approach of just 100 meters but the green is quite long and difficult so be precise on the approach. The course closes with a very fine par five that is quite generous from the tee, but you need a tee shot of at least 240 meters to avoid a blind second which would be challenged by water before reaching the large well bunkered green. Walking off with a regulation par should conclude an enjoyable round on a very fine course. Located within the beautiful Hamar Region, on the shores of Lake Mjosa, the course at Atlungstad is just a wonderfully scenic place to play golf. A new millennium layout from Dave Thomas, it’s a cleverly routed course that mixes some lovely woodland holes on the front nine with a couple of beautiful lakeshore holes on the back nine. Incorporating a lone specimen trees on a number of the fairways (such as at the 3rd and16th) was also a nice touch by the architect. Playing corridors are relatively wide (even for the forested section between the 2nd to the 8th) so it never feels too penal - and why would you want to play a really tough track in such fantastic surroundings anyway? Not that the course can’t be stretched to test the more accomplished players (as the back markers play to a more than respectable 6406 metres) and there are plenty of Thomas-style bunkers on fairways and green surrounds to punish the wayward golfer. My favourite holes were the right doglegged 5th, where the approach is played semi blind to an offset green with a small pond located to the right of the putting surface and on the back nine, the 17th is certainly a sensational Cape hole but I liked the preceding par three at the 16th even better, where its elevated green is perched precariously on the side of the lake, providing a very testing target from the tee. Combine a round here (as I did) with a visit to the refurbished old distillery next to the clubhouse and a wee boat trip on the paddle ship Skibladner and you have a golfing day out that will live long in the memory. Have had the pleasure of playing Atlungstad several times, and it is always a pleasure. Few courses are blessed with such a scenic setting and the designer has made good use of the opportunity and created a course which is tough but fun to play. Interesting variation too as the first holes are laid out in a forested area with the rest in an open country setting. Quite a number of splendid holes, but the closing stretch of the 16th thru to the 18th is particularly strong, perfect for match-play, and with the superb 17th along the lake as the high note. 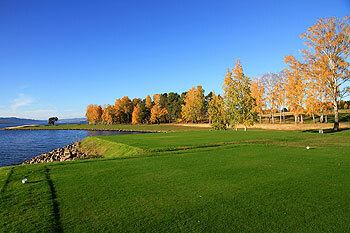 Atlungstad is a very good course situated in beautiful surroundings by the lake Mjøsa. We were met with great hospitality in the clubhouse and the range facilities are good (although a bit far from tee no. 1). The course has a great design and the combination of woodland and heathland is utilised to make a challenging, fair and interesting course for players on all levels. Greens and fairways were good despite the fact that it had been raining for a week. Great job by the greenkeepers! Hole no. 17 is probably one of the most beautiful holes in the Nordic area. I'd say this course is a top three course in Norway and would recommend visitors in the eastern part of Norway to take the trip - it will be worth it!